In general, a software update, is a good thing. However, with the new Phidget22 API, changes are so major that existing code will have to be updated in a big way. We have encountered quite a few bugs with the early releases of the Node.js module. But, lately, things seem to have stabilized. I’m not sure if the module should be considered production-ready but it will be good enough for this article. Before you can get started, you need to install the driver and control panel. To do so, please consult the instructions for your target platform. Supported platforms are: macOS, iOS, Linux and Windows (32-bit & 64-bit). To confirm the installation went fine, you can open the Phidget Control Panel. On Windows you can launch it by clicking the icon in the taskbar. On Mac, it’s an application and can be found in the Applications folder. Note that there is no control panel on Linux. If you plug in a few devices, they should show up in the Phidgets tab. As you will see, the layout is different from the previous version. What is not obvious at first sight, is that you can double-click on any input or output to view details about that specific input/output in a new window. In the image above, you can see the good old PhidgetInterfaceKit 8/8/8. With this device, you get 8 digital inputs, 8 digital outputs and 8 analog inputs. One thing that is new, is that the analog inputs are reported twice: once as Voltage Input and once as Voltage Ratio Input. Voltage input reports the actual voltage read on that input (between 0 and 5 volt). Voltage ratio takes into account the sensor’s type and converts the voltage to a value that’s appropriate for each specific sensor. For example, if you are using a Sharp distance sensor, the value will be reported in centimeters (more on that later). 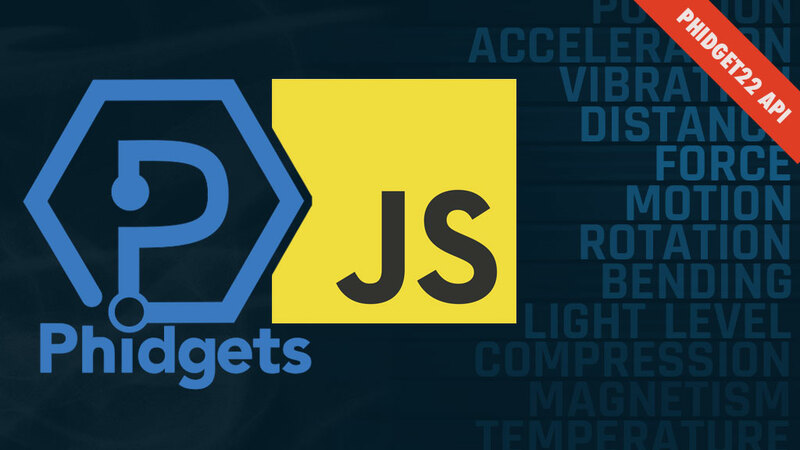 To use the new Phidget22 API within a web-platform-based project (such as NW.js), we have two options. The second option is to use the Node module approach. If you want to use the front-end approach, you will also have to start the webserver in that same tab. 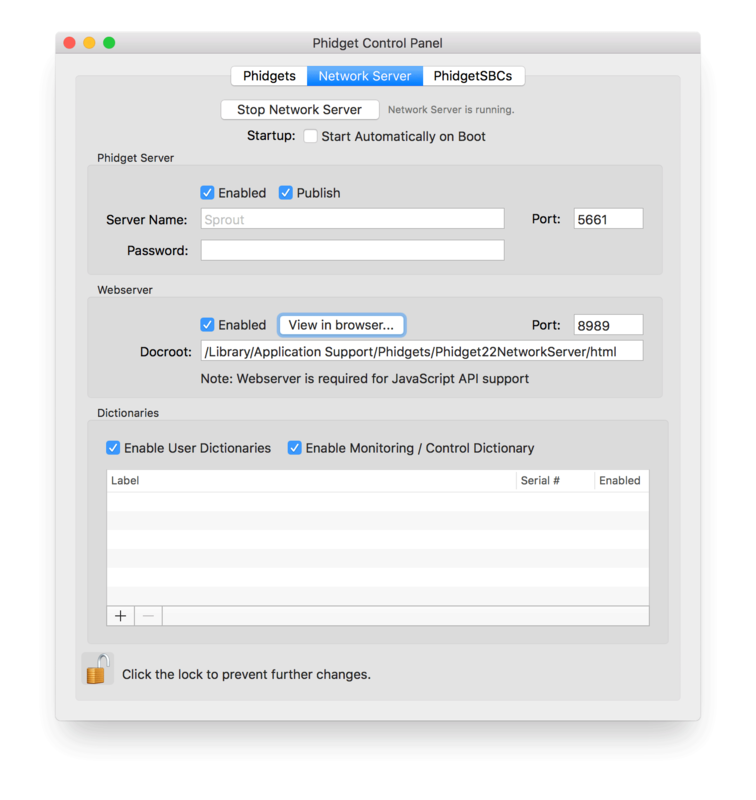 Note: if you are on Linux, the configuration of the Phidget Network Server is done via a configuration file (which can also be used in macOS and Windows). After considering both options, we opted for the Node module approach as it does not require a web server to host the front-end websocket API. However, you may still want to enable the web server as it provides another way to view the phidgets’ statuses. Note: to open the window of one of the inputs or outputs, you need to double-click on that input or output. This will download the module and put it inside the node_modules folder at the root of your project. It will also download any dependencies and put them in that same folder. By using --save we are specifying that this module is a dependency of our project. Therefore, it will be added to the package.json file’s dependencies. Note: we are listening for the « load » event in case our page relies on front-end libraries. The start() function is called upon a successful connection. Inside that function, we will add the code to talk to a specific sensor or actuator. This is where the API has changed. A lot. 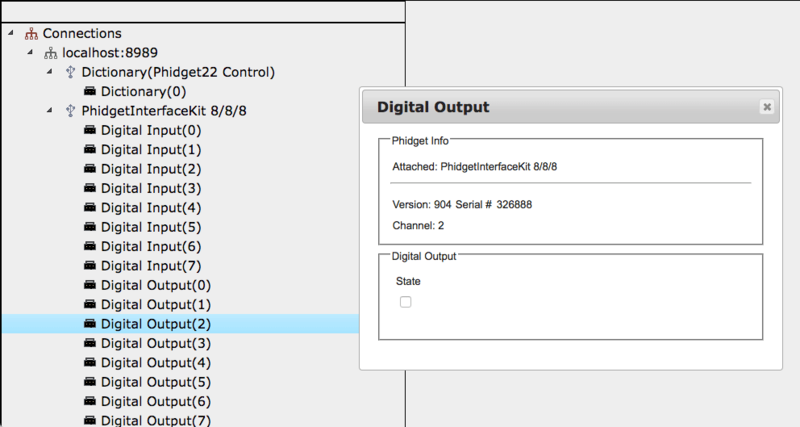 The Phidget22 API introduces the, somewhat ambiguous, notion of channels. A channel is an object that allows us to interact with an input or output (local or remote). Let’s look at an example. Let’s say want to use a Sharp distance sensor. The sensor is connected to an analog input (a.k.a. voltage input) on a PhidgetInterfaceKit 8/8/8. Where do we start? The first thing to figure out is the type of channel object to create. If we look at the control panel, we can see that the PhidgetInterfaceKit includes support for digital inputs, digital outputs, voltage inputs and voltage ratio inputs. The distance sensor is an input and is not digital. But is it a voltage input or a voltage ratio input? 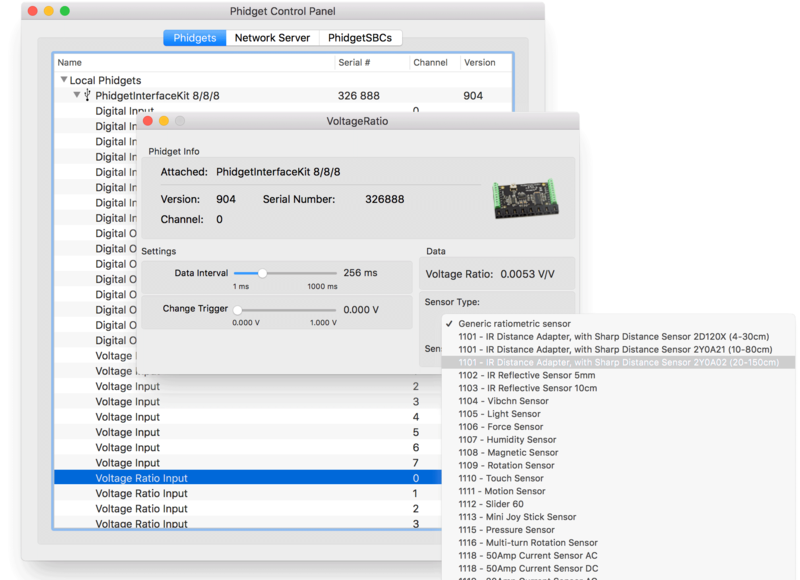 As you probably know, it is possible to have several PhidgetInterfaceKit devices which, themselves, are connected to several distance sensors. How do I tell the Phidget Network Server which of these sensors I want to talk to? By setting the device’s serial number, we make sure to limit possible matches to the device with a serial of 123456 (the PhidgetInterfaceKit, in our example). You can fetch the serial number from the control panel. If you don’t specify a device, it will look at all connected devices be they local or remote. This means you could accidentally connect to a device that’s not even hooked up to your own computer. You can also set a « channel » to use. This is a very unfortunate choice of word. Here, « channel » means the port or input from the PhidgetInterfaceKit to which the sensor is connected. You should always specify the channel. If you don’t, you will match the first port (a.k.a channel) that is a VoltageRatioInput even if nothing is connected to it. I’m sure there’s a rationale behind this whole channel-matching approach but it does feel a bit convoluted. When I connect a bunch of sensors, I know which port and device they are connected to. I don’t need pattern matching to find them. I guess some people must have a use for that. To me, it just feels more complicated for simple setups than the previous version. Once the device is attached, we can start to listen for data changes on the sensor by using the onVoltageRatioChange function. Note that setSensorType() should be called after the channel is attached. Note that setDataInterval() should be called after the channel is attached. Obviously, this is but a very small sample of what can be done with the Phidgets in NW.js. But, hopefully, it will get you started with the new API in less time. If you wish, you can download the code used in this article. It is known to work with version 1.0.7 of the phidget22 Node module. Note that the module itself has not been included in the download package. You will need to install it with npm install. Phidgets Inc. provides a number of examples for various sensors and actuators. You should definitely check them out to help you get started.